Participating in leisure connects us like nothing else. A man looks toward the beach as kite-boarders get ready to launch their kites. Behind him are stand-up paddle boards waiting for customers to come out and play. Perhaps he is a former kiter or windsurfer reflecting on the good old days? 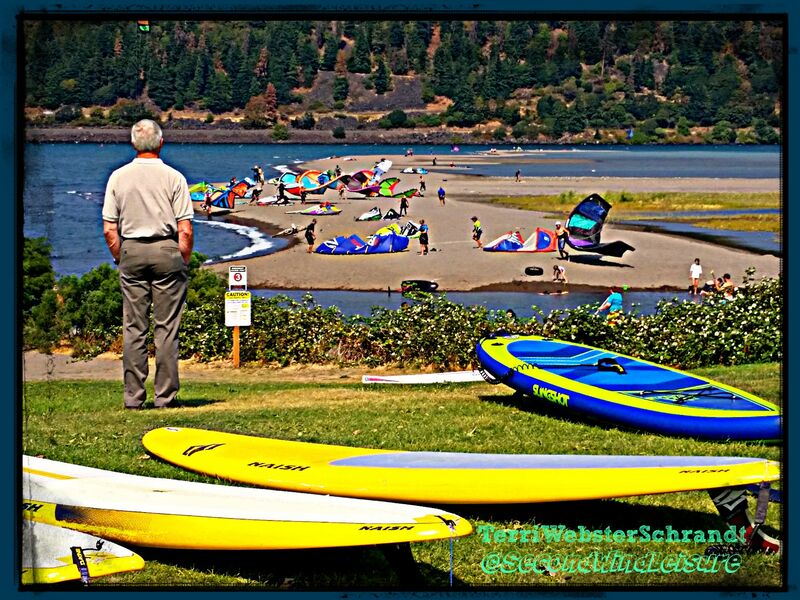 Perhaps he is a merely a tourist taking in the beauty of the Columbia River Gorge. His contemplation of the view connects him in ways we cannot imagine. This photo is also submitted to Nancy Merrill Photography for her weekly challenge A Photo a Week: From the Back. Great photo! If I were him, I could stand there with that view all day! Thanks for entering this pin in The Pinterest Game! Good luck, and we hope to see you again next week. What a great shot, I love to look at images and make a story, I bet he is an old surfing champion, reliving his glory days, but he is also really smart and knows that he can rent these boards to tourists and make a great living, once the tourist season is over, he will hit the waves again! I like that Nikki! Good imagination! Thank you for your kind comment, Kristina! I was lucky to spend my weekend outside, even if it was to pack up our windsurf camp. I did get to SUP two days and that is always a blessing! Oh shoot! Done it again – I landed here from the MidLife Luv Linky party. I keep forgetting to say that! Hi Terri, great shot with popping colors. What strikes me straightaway is that the guy is a complete observer rather than participant or natural part of the activities that seem to go on on in this scene. Like he wandered over from another movie set to have a look. It leaves me wondering if maybe he has a younger relative here somewhere doing some paddle boarding and he is just watching from a distance. Brilliant shot for creating discussion. Thanks, Gilly, great perception from you! Hi Terri, we seem to have linked at all the same places today! I think the man is wishing. Wishing he could be out there among them -having fun in the water. Wishing he could do what used to be able to do or maybe wishing he had learned when he was younger. He is wistful. wistful…I like that! I hope he was inspired to go out and do something. I am, thank you so much! Terri, what an interesting and thought-provoking photo… Especially the fact that he’s got his hands in his pockets…makes me think he’s wishing he could participate too in the fun? Great observation, Lia, that’s what I thought, too. Have a great 3 day weekend! Great photo! Thanks for joining the challenge!